A rainy evening tinged with the lingering taste of aphrodisiacal mangoes and lilting verse is responsible for the arrival of a storm in the Kaushiksâ Delhi home19 weeks later. Three generations must confront an uncomfortable reality when it is revealed that the parents of a teenage son and a twenty-something young man are expecting their third child. The boysâ"Nakul (Ayushmann Khurrana) and Gullar (Shardul Rana)â"are aghast and embarrassed. Their grandmother (Surekha Sikri) is disgusted. The neighbours gossip and friends snigger. The parents-to-be are made to feel ashamed about their late-night activities, because the notion that adults are intimate with one another is somehow repugnant in a conservative, middle-class society. As it turns out, it is problematic even for a seemingly progressive upper middle-class parent, which we see when (Sheeba Chadda) tells her daughter Renee (Sanya Malhotra) that her boyfriend Nakulâs family is akin to a âcircusâ. Sikri is fiery as the caustic, blunt and controlling mother, mother-in-law and grandmother. 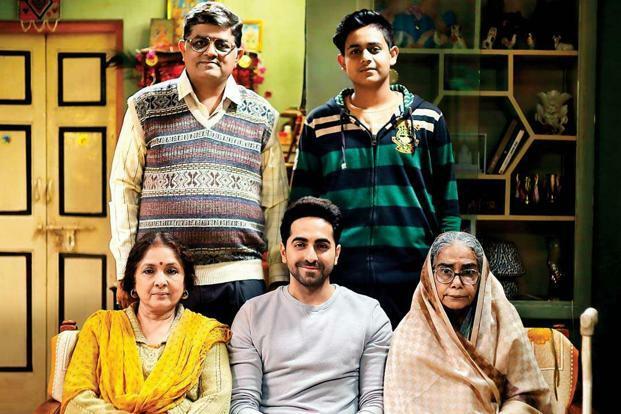 Khurrana slips back into a part he has perfectedâ"that of the regular middle-class Delhi boy-next-door trying to navigate out of a dilemma. This time he has to overcome his own prejudices and embarrassment borne out of a concern for âwhat people will sayâ. Rana and Malhotra are able co-players. Dialogue writer Ghildial coats a taboo topic in a veneer of humour. The screenplay builds in just the right amount of emotional nudges and Sharmaâs direction binds together all the elements to deliver a sat isfying watch.